Choosing a school for your daughter’s secondary years is a significant decision for both you and her. This decision will impact her development during her school years and inevitably shape the woman she becomes. Choosing the right school is all about the right fit for her. It means giving her the best opportunities to achieve her potential whilst balancing her interests and talents. We understand she will want to be happy and enjoy going to school but we also know you will want her to be safe, supported and guided through the journey. At Mount Alvernia we believe we offer the right balance of education, extra-curricular pursuits, pastoral care and spiritual guidance so that your daughter has the foundations to become a confident, capable and resilient person. Our Alumnae are testament to this. It is my privilege to have been the Principal of this College since 2009 – during a time when the changing nature of education has been being widely discussed and considered. Important issues like the development of the Australian Curriculum and the debate about the merits or pitfalls of national testing indicate that the education of present and future generations is still open to discussion. 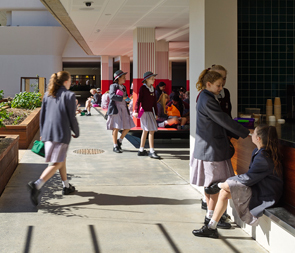 It is in this context that Mount Alvernia College, with its leading academic, vocational, sporting and cultural programs, gives young women a range of options where they can excel and achieve their best. The College has a fine reputation for academic excellence in both middle and senior years, and recognises the importance of providing flexible pathways that respect the gifts and talents of each young woman. Our pastoral care is proactive and positive, and an important feature of school life. All students are made to feel welcomed and included in all aspects of College life. Specifically, we have an international reputation for our music programs and offer music to suit all students’ abilities and interests. Our music program has been acclaimed, and our teachers are renowned for their innovative programs that develop this important part of a young woman’s education. The Franciscan values of love, simplicity, joy and respect for all creation are actively promoted in all aspects of the school community, whether it is in the classroom, on the sporting field, in the music centre, or in the various outreach programs that the College supports. In a world that, at times, promotes an unhealthy emphasis on success and materialism, these Franciscan values provide the touchstone for an authentic Catholic education for young women in the 21st century. Whilst the Franciscan values guide us in all that we do, our teaching staff utilise our Learning and Teaching framework to provide a consistent and safe learning environment to help our students achieve greater success and for students, parents and teachers alike to gain greater satisfaction and outcomes. The framework exists to ensure all our staff pursue professional growth and development so that our school can be at the forefront of educational practices. By choosing Mount Alvernia College for your daughter, she will be in an environment where she will not only learn and develop, she will flourish. Thank you for taking the time to find out more about us and to see what we can offer you and your daughter. I look forward to welcoming you both to our College community.